For some perverted reason, over the last few years there’s not been a Christmas that has gone unspoiled by some tomfoolery. This year, the flashpoint is apparently centered in the Washington State Capital building, where an atheistic organization placed a sign protesting religion in general, Christianity in particular, and Christmas expressly. The Freedom from Religion group petitioned to post the sign, and the state apparently didn’t find it worth opposing. Of course, instead of posting an alternative symbol aiming to include and represent non-Christian citizens, it instead was a hostile rant seeking to vilify the origins of Christmas, marginalize Christianity, and declare all people of faith to be deluded or delusional. The group in question has proven itself to be naught but a vindictive group of killjoys for the rest of the nation who are willfully ignorant of certain historical facts that are not in dispute. Not only this, but the state of Washington, the governor in particular, has proven itself to be an unprincipled band of kowtowers to the foolish kook fringe who tend to gravitate to the Seattle area. First of all, the holiday is Christmas…not the winter solstice, not Kwanzaa, and not Hanukkah. The holiday takes place on December 25th, not the 21st, not the last seven days of the year, and not a week determined by a lunar calendar. Christmas is a lot of things to a lot of people, but it remains at the core a day set aside for the celebration of the birth of Lord Jesus Christ, which remains, by anyone’s measure, a major turning point in human history. Was it a co-opt of previous holidays? Maybe it was…the Bible doesn’t call for the veneration of the incarnation of the Savior of the world. But what matters is that this nation sets aside this day for that reason. Furthermore, whether that’s the actual day He was born is immaterial; the Martin Luther King birthday commemoration isn’t necessarily observed on the day of his birth…just the closest Monday to it. The complaint of the sign is historically baseless. Next is the fact that this sign is set up in protest of the symbols already on display in the setting in question. I say, “okay, then place an alternative alongside, put on your happy pants, and move on with your life.” Oh, but no! There was no alternative symbol offered…they posted a position statement. And a patently offensive one, at that. I know a guy on a message board who has as a signature file a statement by epic idiot Bill Maher, “don’t be so tolerant that you tolerate intolerance.” This is exactly what this band of miscreants has done, but I don’t see the PC police mobilizing to defend the offended here. But I’m not looking, either, since I’m not so foolish that I’d expect it. It’s open season on mocking the faithful, and it’s pathetic that a state government has given such a hateful attack its endorsement. It’s a display that smacks of spiteful children railing about how unfair some fact of life is. I mentioned message boards earlier, so consider this example of such childishness that should certainly be familiar to those who’ve ever been part of such online communities. A thread is begun on some topic that people feel strongly about…let’s say it concerns football. Board members trade posts about what they think of the season, their teams, make prognostications, argue over who they think is best…and then some colossal nerd comes in saying, “sports are stupid, football is the worst of them, and you’re all idiots for liking it.” This sort of puerile peevishness almost exactly describes what has happened in this case. Especially since no one has ever came up with a working theory out of that hypothesis, unlike the previous statement. Nice way of inventing a quibble to work in such a petty dig. My statement in the article concerning “spiteful children” comes to mind. This isn’t a discussion forum, so I won’t be going all in on this topic. But you’ll find that there’s about as much scientific evidence for one as the other, and only one can explain the occurrence of the other. Intelligent Design vs Evolution and the Big Bang… Firstly, Intelligent Design is NOT science at all as there has been no discovery or results from it despite centuries of people trying to prove the Biblical account correct. Instead, there has been an amazing amount of research done trying to find a correct answer and ever since Evolution and the Big Bang Theory have been first thought of all evidence since then points in their direction. That’s over a hundred years for Evolution of religious people trying to disprove it and the best they have come up with is they think it violates the 2nd law of Thermodynamics. Which it doesn’t. That’s it. The only reason people do not believe (rather, understand and accept) these concepts is indoctrination, fear of death, and because most people they know happen to be religious like them. Mind you, I don’t support aggressive atheism like this but it’s a hell of a lot better than aggressive Christianity blowing up abortion clinics or trying to hold down homosexuals from having basic rights the rest of us have. I wish those in such fervent opposition to atheism would learn about it at least half as much as atheists have about their beliefs. If they did, then hopefully they would understand that this whole straw man is attacking the findings of methodological naturalism NOT atheism. Atheism is not believing or an active disbelief in god(s). It is one position or stand on one topic: the existence of god(s). It is not an entire worldview or philosophy, hence the variability in what different atheists believe. While many atheists are naturalistic in some manner, not all are and they are not the same thing (there are atheistic existentialists, atheistic Marxists, and so on who could care less about science and metaphysical naturalism). This is a prime example of what I’ll call “seminar commenting”. This article was written over three years ago, and only now it’s getting comments? And from people whining about my exceedingly cursory reference to the creation accounts of postmodernist society in a goofy, satirical image I found posted on a message board? First off, Shane, there’s no such thing as “aggressive Christianity”. It’s an oxymoron; abortion clinic bombers are not Christians; they’re activists who wrap themselves in a Bible to justify bloodlust. WWJD? Besides that, it’s not like there’s some sort of epidemic of that happening in the first place. As much as I hate abortion, I’m not going to kill someone else over it…it’s the state’s job to kill killers, not mine. As for basic rights for homosexuals, the last time I checked they could still buy property, vote, sit at the front of the bus, etc. My opinion on that is complicated so I won’t go into it here (I’ll save it for my next blog post, which should be due sometime next year), but there is no basic right being opposed by anyone for gays. As for the whole evolution big bang stuff, I want to say something I’ve made clear to friends across the table of this debate for years: I want the evolution and the big bang taught in every high school in the universe. This might shock some of my Christian family and friends, but I highly encourage the teaching of current and ongoing scientific work in all fields. My only issue is that it be presented wholly. For instance, evolution does not answer the origin or proliferation of life, which may or may not be ironed out in the future. The big bang theory provides a strong framework upon which cosmological studies can take shape, but it can’t and doesn’t explain the building blocks of that framework. They are not set in stone, and they never will be…like all science, even those premises accepted as scientific law. But they should be taught and explained as what they are–the current understanding and study of science–and not what they are too often held up to be–the epitaph on the tomb of religion. Where religion is concerned, I have nothing to fear from science. The scientific record and the biblical record are largely found to go hand-in-hand in the majority of cases, and, when they don’t, it’s because of a lack of understanding of one or the other, or even both. You mentioned the second law of thermodynamics, which is often used as an attempt by creationists to disprove evolutionary science…basically, that the universe is breaking down rather than becoming more complex. This is often dismissed because earth is not a closed system and energy is constantly being added to the system (i.e., sunlight). It’s also where the big bang falls on its face, barring a few spurious suppositions that by nature can’t be verified. And statistics show that no amount of glorious change-inducing energy being poured into this planet would kickstart the evolution of the variety of life it has sustained at the rate at which it has flourished in such a small amount of time. You wind up at every turn looking headlong into an uncaused cause. These are just the largest issues of these well-developed but still lacking courses of study…all of which, again, I believe should be explored in science classes across the nation. Xam, atheists have as much variety in their personal beliefs as Christian groups do. It’s impossible to explore the minutia in the limited time I have available for such flights of fancy. But, as you said, atheism is the belief that there is no divinity and therefore no loyalty to one, and it is to the Freedom From Religion group my ire was aimed. The problem is that you, like the two who were ahead of you, are responding to the snarky little picture rather than the article itself. Your reference to methodological naturalism has absolutely nothing to do with what I was griping about in the article, which was, in a nutshell, an atheist group making jerks of themselves for no good reason. Ultimately, all three of you totally missed the point. Are you so thin-skinned that any resistance to your preferred creation account must be bludgeoned with the flail of ignorance so as to brand that label into it? All you were able to beat was a dead horse. I hit the nail on the head in the article with my reference to “puerile peevishness”! First of all, you dont added a photo or a citation of the sign that the atheists were using, so all of your post is invalid. But i respect you for being a religious guy who actually believe that evolution should be tought in schools. 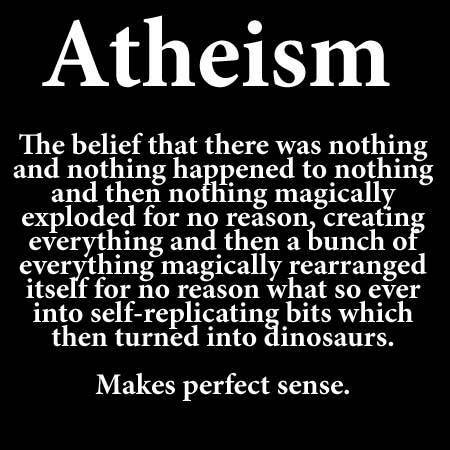 For the picture about atheism, i believe you dont take that seriously (or you shall not be taken seriously) . I don’t need citations to complain. It was a current news event at the time. Granted, you’re a little late in the game, but to declare what I have to say invalid because it doesn’t present you with a bibliography or an end note page is foolish. But I can help you out a bit if it really bothers you. Of course evolution should be taught in schools…it’s an area of ongoing scientific study that is valuable not just for the information itself but as a continuous application of scientific method. My only caveat is that it should be taught warts and all and not as the hyper-streamlined version popularly accepted as scientific fact. The picture I posted about atheism continues to be the flash point that instigates hostile outside commentary. I am continually amused that people who mock those they disagree with are flabbergasted when the tables are turned. What I think, say, an atheist should think upon seeing this is, “huh, cute,” not, “OH MY FIGMENT OF MY IMAGINATION THIS IS AN AFFRONT TO MY FREETHINKERNESS,” but that’s life. Is there anything there that my hypothetical atheist would factually disagree with aside from the somewhat loaded use of the term, “magically”? No, it’s the connotation that the evolutionary position is in some way weak when it’s supposed to be unassailable. The percentage of people who “remenber of jesus on the christimas” doesn’t matter one whit since I don’t run demographic studies when I make comment on something and the Man’s title is in the official name of the holiday. Whether you love, hate, believe in, or deny Jesus Christ, the day is named after Him, and that means something to a lot of people, even way down in your homeland of Brazil. If you’re looking to deride the observance of Christmas for the rampant commercialism that surrounds it, I propose that Charles Shultz already did it, and he did it best. The point is that I am mightily offended by the jejune attempts of those who would expunge any lingering remnants of actual meaning and religious attachment to the thing and offer it wholly to that same materialistic god you seem to decry. But that could just be the language barrier.